A silvery full moon, a midnight blue sky, wheat the colour of gold swaying in the evening winds…Luna Sol captures the best of prairie evenings and transforms it into a stylish wrap that fits into your everyday life. 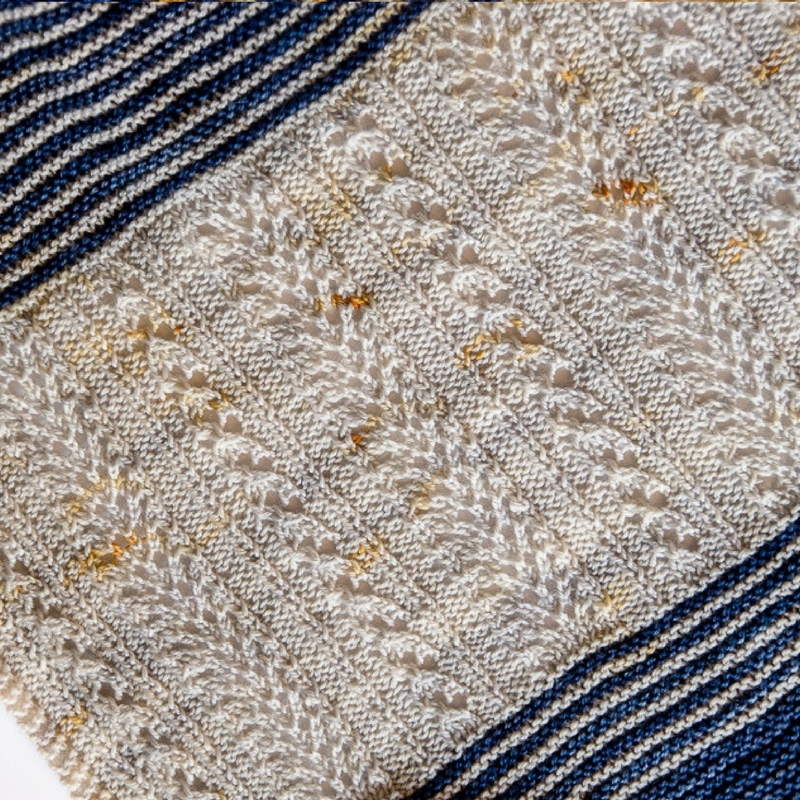 Garter stripes and wheat-inspired lace ribs dance across this shawl. 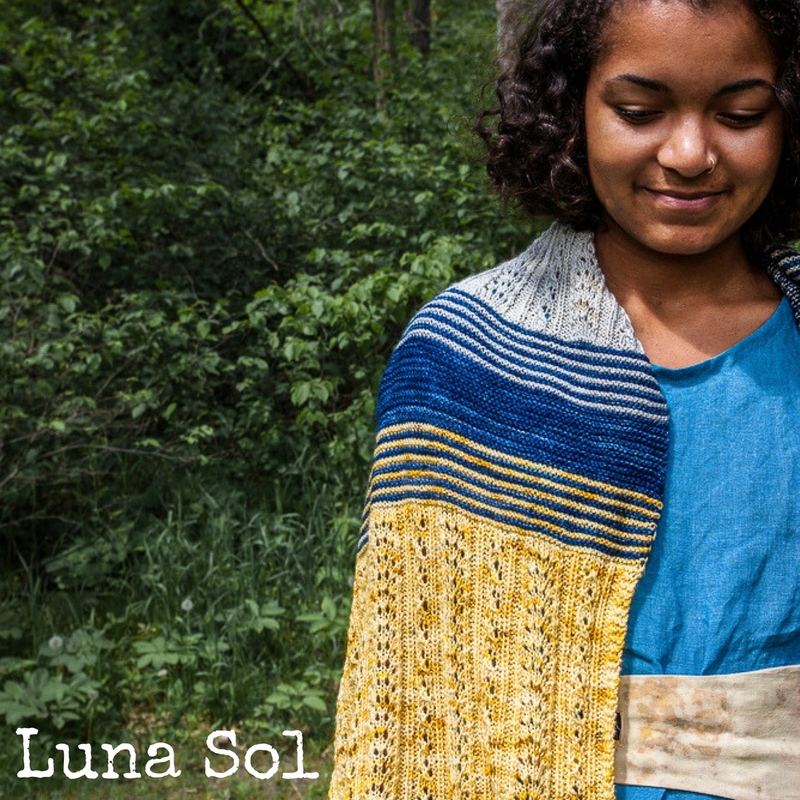 Luna Sol is an unusual parallelogram shape that’s easy to work. Depending on how you wrap it, you can play with the two sections, showing more of one colour or the other, and that makes it twice as fun in your wardrobe. Knit from tip-to-tip, it’s easy to customize for length. The directions include a note on where to stop and check yarn usage so that you can add/subtract length as needed. I’m really excited about this one – it’s been in the works since the depths of winter. 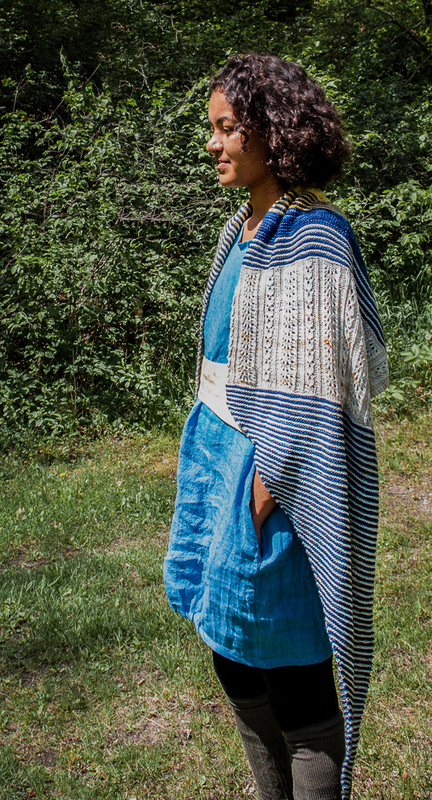 Luna Sol is part of the Flatlands Collection, a set of patterns from Manitoba designers using Manitoba yarns. I was lucky enough to work with Hilori’s Magical Yarnorium. I knew I wanted to knit a shawl or wrap using at least 2 colours. She came up with an inspiration photo and idea that gave me the seed for the whole design. Stay tuned for a post all about the inspiration and design process tomorrow. Hilori has kits! And you can mix and match up your own combo, too. If you’ve got an idea, message Hilori – she’s got a great eye for colour and combinations. This project is may look complex, but it’s secretly quite simple. You see, all of the shaping is done in the garter stripe tips, and that means that the lace sections are simple straight panels. The two lace patterns are also placed as ribs – set off by purls, they create their own clear lines. I didn’t need stitch markers to set the repeats apart once I had worked a few rows. There’s a Knitalong. The Flatlands Collection is all about Manitoba makers, and that means you! See more photos on the Ravelry page. And check out the growing project listings as my testers link up their versions.